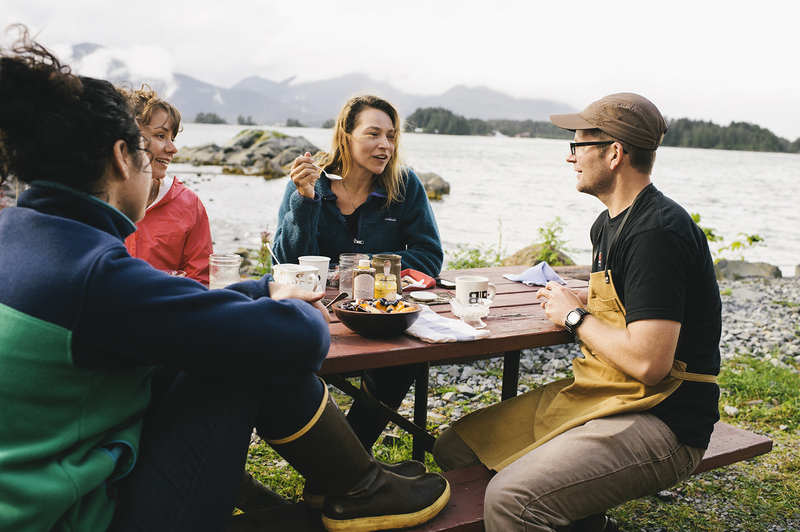 Diana and I had the good fortune of spending our final morning in Sitka last summer with an epic breakfast. We spent the morning with wonderful, fascinating people, an incredible view and delicious food – our trifecta for happiness. We set up shop at an open picnic table across from our friend Trista’s home. This falls just east of the Sitka Sound Science Center and overlooks Crescent Bay. Our magical trip couldn’t have been concluded any better. There are a few ways to have breakfast. One, as a simple start your day, quick but satisfying; two, as a ceremony for yourself to enjoy downtime, think Saturday morning reading and lingering over toast and eggs; and three, to gather friends. Like any good meal, it is better shared. We absolutely love breakfast so we regularly celebrate all three. To make the most of a weekday breakfast, we like to have quick options, like granola, already prepared to eat out of a jar if we’re on the go or over yogurt at home if there’s ample time to eat. Our weekend breakfasts are more of an event, like shakshouka, muffins (that we freeze to eat leftover) or a quick scramble with toast and bacon. Hosting a breakfast or brunch is a different story so here are a few tips to make it effortless and enjoyable. The days of roommates and summer shares fighting over dishes and resorting to paper goods are over. The environment and your guests are appreciative. Even the most humble meal is nicer on real plates eaten with real forks. I’m also a fan of cloth napkins, but you don’t need to take it there if you don’t want to. Coffee mugs on the counter, serving dishes and utensils, a carafe for water or juice, whatever you’re using – take it out. Don’t cook anything the morning of. I know this sounds insane, especially coming from me, the crazy lady that loves to roll out dough, crack some eggs and make a meal for a big group, but here’s the thing – I’m not a morning person. I can wake up at a reasonable hour, but I’d really prefer to read TheSkimm in bed than to get up and chop vegetables. Reheating or hands-off baking is a-ok.
By the end of the week, I always have bits and pieces from previous meals and I try and use it all up before a weekend farmer’s market or grocery run. Think turning tomato sauce into shakshouka or stale bread reinventing itself as a French toast casserole. Leftover veggies belong in your quiche, scramble or hash. Be creative. Whether it’s your orange juice squeezed but waiting for bubbles or a Bloody Mary concoction mixed and ready for ice cubes and freshly cracked pepper, you need to have your act together – juice in pitchers, ice on hands and caffeine ready for those in need. Your coffee situation should be set up so that all you need to do is pour water in your French press or hit a button on your machine. You’ll be able to enjoy whatever you’re serving if all you need to do is pour. Ditch the phone after you Instagram, talk to the people around you and be in the moment. If breakfast in Sitka didn’t involve leftover crostata from last night’s dinner party, I never would’ve gone on a run with a dog. That’s probably the fourth time in my life I’ve ever run anywhere so I’m glad it wasn’t compromised by making sure yolks were still runny and everyone had coffee.